=Getting ready to take my son's senior tennis photo, when the camera beeps at me. I attempted to take the photo again and it did the same thing. Thinking it was the batteries, I quickly asked someone else to take a photo for me. Found out my memory card was full. And I still haven't received a picture from the senior tennis day 1 year later. I was taking pictures of a family party and it was a dark room. My camera was not focusing right because the subject was too dark and I guess when things are dark the auto-focus doesn't work right with some cameras. I turned off the auto-focus so that I could focus my camera on my subject using manual instead. Later, I was taking more pictures, but I forgot to turn my auto-focus back on. It was a big mistake because I took another 25 or 30 pictures that came out blurry. I was able to use about 5 of them. The rest were bad photos. I couldn't tell that they were bad by looking at the LCD screen, because I didn't zoom in on the playback feature to check them for sharpness. I was all set to take pictures of fireworks in my home town at our annual 4th of July celebration. I had been taking pictures of all the people playing games at our picnic all day. The mistake I made was not to take extra batteries to the lake to photograph the fireworks. 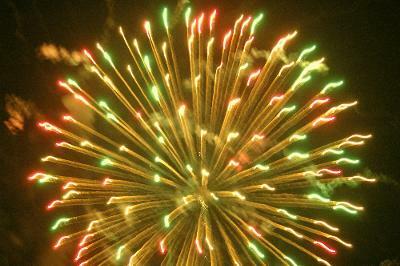 I had my tripod ready-I read your article on taking pictures of fireworks so I thought I was all set. I guess the long exposures use up more battery power on the camera, so I got three bad photos and one photo that was okay. It's a mistake that I won't make again because I was really ticked off that I spent 15 minutes missing trying to find extra batteries and missed watching some of the fireworks. "I was walking with my fiancee in a park in central Missouri. As we walked through an area that had been recently tilled, I notice a large bald eagle foraging in the mulch. I instantly swung my camera around and snapped off 4-5 shots as the eagle gracefully flew away past the trees. Excited to see the potentially majestic photos, I reviewed them on the camera's LCD. I had forgotten to reset the shutter speed from the photos we took in the house before, and metered way too bright. All I got of this rare encounter was a white screen and a very faint outline of trees." Thanks for sharing you photo mistake. It's always a tough one when you miss a photographic opportunity because of an exposure error. I've taken plenty of photos where my mistake was not taking that 3 seconds to check my camera settings quickly before I aim and squeeze the shutter button. I am sure you didn't have a lot of time and you had to shoot quickly. That's for contributing your story to my site on digital photography tips! One of my fraternity brothers was getting married. He asked me to take pictures for him and his bride. This was back in the day of 35mm film photography. Well, you know what happens when a bunch of fraternity brothers get together: the drinks are flowing. During the reception, I needed to rewind the film in my Minolta xd-11 camera. You had to push a release button and manual rewind the film into the cassette, before opening the back of the camera. Needles to say I was not sober. The mistake I made was that I misjudged the amount of rewinding that I had done. So I opened the back of the camera with about half of the film still wound around the winding spindle. I was a little lucky in that the country club room was fairly dark and I noticed it right away as I opened the camera back. I quickly shut it and finished rewinding the film. I felt guilty as hell for about a week, until the photos came back. There were only two photos that were unusable and three that were "fogged" some but printable. Fortunately this photo mistake involved snapshots at the reception and not the posed formal portraits or the photos taken during the ceremony. The bride and groom have laid back personalities and were not mad at all. I was asked to take pictures of people in my church to raise money for the youth group. I am going to school for photography, therefore, still learning. So, I took pictures, and all the pictures turned out great. Or so I thought until I looked at them on my computer. Everyone turned out a little orange. It was from the lighting, but when I took the first picture on my camera, it looked fine. What looks good on your camera, isn't always the case on the computer!!! Fortunately, I was able to tweek the pictures, whiten their teeth and eyes slightly so it did't appear like they all had jaundice!!! AKA: Yellow! It took HOURS of tweeking just because I didn't use a grey card. White balance will only work so much without a grey card. So lesson learned, if you don't have a grey card, GET ONE!!!!!!!!!!!!!! Good advice Deanna on a way to avoid a mistake with color balance! I was the "official" photographer for my friend's wedding when were students at Penn State University. I had my Minolta camera loaded with film. After the film counter kept advancing: 37, 38, 39, I knew something was wrong. Of course the frame counter kept moving but the film inside the camera wasn't moving. This photo mistake happened during the actual wedding ceremony-so I got no photos of the bride and groom making their commitment. Do you have any idea how bad I felt? Photographing the moon is easy, if you know a few things beforehand. I made the mistake of trying it on my own without doing at least a little research first on how to take decent photos of the moon. I knew that I shouldn't use auto-exposure as the camera's meter would overexpose the moon in an attempt to compensate for the darkness of the nighttime sky. I also knew I'd want to use a tripod to prevent motion blur when using a long telephoto lens. The mistake I made was in the initial shutter speed. I was surprised to find out that I needed a quick shutter speed despite the appearance of the moon as a stationary object. 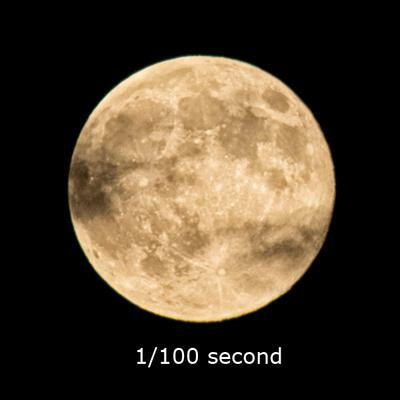 To capture the moon in a detailed and sharp image, the shutter speed needs to be pretty quick, about 1/100 second or faster. Both of the images above were shot with a 400mm lens and then cropped to the same dimensions. Both were sharpened the same small amount in Photoshop. Look closely and you can see that the photo with a 1/100 second exposure is sharper than the moon image shot at 1/80 second. A faster speed of 1/125 second would be even safer to ensure sharpness with such a big lens. Here is the link with the steps to follow to get sharply focused, sharp, and properly exposed photos of the moon. 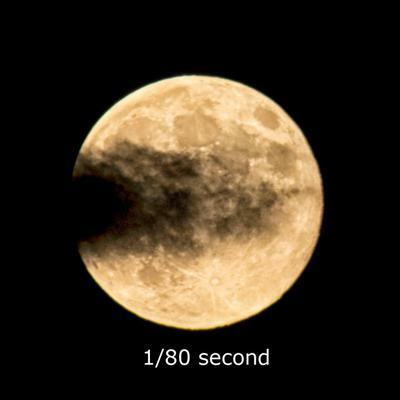 LINK: How to Photograph the Moon. Make sure to have fun with your moon photography! I was taking pictures outside of our local high school before a basketball game, so I set my camera setting on daylight. Then I went inside to do take photographs of the game. I did remember to change my ISO setting to the highest setting on my camera to get a high shutter speed. I've taken plenty of blurry photos inside before. I have been getting lots of great tips on taking digital photography from your digital photo tips web site. The mistake was that I left the camera set on daylight. The gym has those weird colored lights, I think they were mercury vapor lights. My photos had really strange colors, like purplish and greenish. I tried to do some photo editing by using the auto color balance in my software, but the colors of the people never looked quite right. As you say in some of your photography articles, making mistakes is the best way to learn to take better photos. I was excited to get some great actions shots, but ticked that they would have been better photos if the color wasn't so bad. Thanks Better Digital Photo Tips! Mistake to choose digital camera based on CCD vs. CMOS sensor. It is now a mistake to choose the kind of digital camera you wish to buy based on whether it's a CCD or a CMOS sensor. In the early days of digital photography, CCD sensors were clearly better. They had less "digital noise" and better sensitivity to low light situations than the cheaper CMOS sensors. Now the gap in quality is insignificant. I guess you could call it a photo mistake to choose a camera based on a technical difference in how a digital camera takes photos. What really matters is if the camera has the features that are important for the kind of photography that you do. Most of the camera are so advanced-even the cheapo point and shoot cameras, that it really is the photographer that makes all the difference between a successful photo and a bad photo. While photographing a little league baseball job. I was shooting the singles and my colleague (employee) was shooting the team photos. After the 5th team was photographed, my employee turns to me and says " Are ya sure this camera's on auto focus?" "NO" It turns out the camera was switched to manual focus for the previous job and never checked before the new job. Never Assume your "help" is familiar with your equipment. Always check and double check your camera settings on your equipment....... As well as your employees. This is coming from two seasoned Pros. Turns out I was able to save them in PhotoShop. When on vacation in the Smokey Mountains I left my digital camera storage card out on the picnic table and the local raccoons stole it and ate it. I never did find out if the pictures were blurry or out of focus. It was a shame because I really think I had the composition I wanted. It's a mistake to think your photography will automatically get better from a buying a new expensive camera digital camera. "It's the skill of the magician not the size of his magic wand." Have you ever heard that one before? There certainly is some truth to it. A very talented photographer can create great photos with a simple camera. Likewise, committing composition and lighting mistakes with a sophisticated DSLR camera with still result in bad pictures. Here is another saying: "The lumberjack with the sharpest saw cuts down more trees." Translation: two equally talented photographers may get different results if one has a cheapo point and shoot camera and the other photographer has a quality DSLR. Conclusion: Both the quality of the camera you use and the quality of the photography techniques you employ are both important factors in avoiding photo mistakes. I am a photography geek so I like buying new camera accessories and yes, upgrades to my collection of cameras as well. I work hard at my regular jog, so I want to reward my self with a few "toys" now and then. It is not always a matter of buying a new camera to improve my photography, although it sometimes does make a difference in the images I create. I was approached to do a family portrait on the beach. The family was celebrating a wedding anniversary and was having dinner at 4:00 in the afternoon. The best time to shoot portraits on the beach is around sunset. The light is more pleasing when it starts to fade in intensity and it can give you that nice warm glow. Your subjects will not squint from the brightness of the mid-day sun and the accompanying bright reflection of light off of the sand. The family did not want to do the portraits after their formal dinner, which was understandable. The kids would be tired and everyone would have to change into more casual, color coordinated clothing just for the beach photography. I told them that I am picky about my lighting and that they would be disappointed in the photos. Early on in my portrait photography career, I made that photography mistake of taking a family portrait under the midday sun. The family decided to have another photographer create their beach portraits for them and had the photos taken in the early afternoon. I saw the son-in-law a month or two after our initial conversation. The family was disappointed in the photo session and agreed that it was a mistake to do the shoot in the middle of the day. It would have been my mistake to have accepted that portrait job.